Then there came a day when the children were feeling the winter doldrums. They were sick of the same old games. Tired of the same old books. They must have been looking for any new source of entertainment because one of them unearthed the old wooden train set tote from way back in the depths under Olivia’s bed. What a find. They have spent hours upon hours this week, all three of them together (! ), building and engineering, planning and executing elaborate railway systems that snake and twist all through the house. I marveled at the care and consideration that went into the building process. 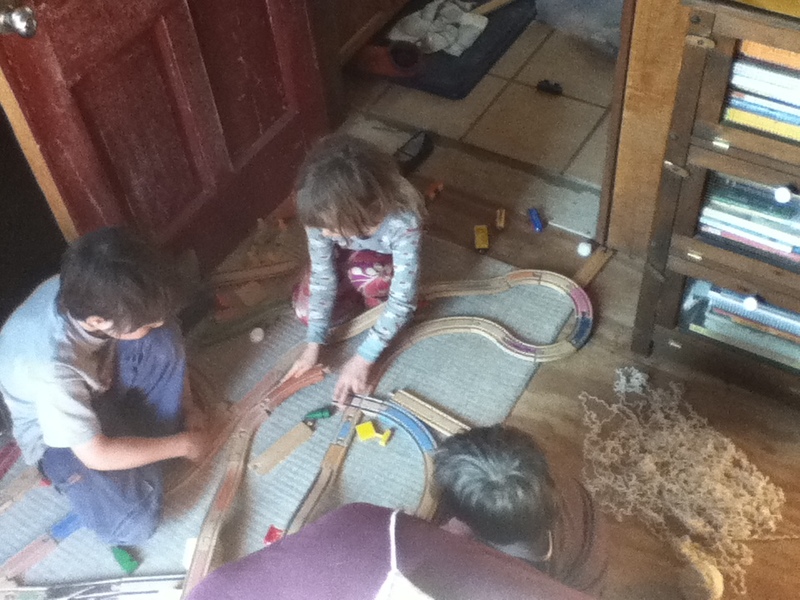 I didn’t even mind seeing my tidy bedroom be consumed by three little engineers that had found harmony together! But I think what caught my attention even more was their ability, after all of that thoughtful work of construction, after all of that time spent perfecting all of the track’s details, to crash a train which quickly led to a full-blown tornado-style upset of the entire track. “Geez, guys!” I heard myself saying. “All of that work!” But they didn’t seem to care; they were still having just as much fun. Then the light bulb flickered on over my head. Right. Was all of their work just a waste of time? I don’t think so. I was reminded that it is not always the finished product that is the goal. Sometimes we learn a whole lot along the way. After watching my children absolutely trash their train set after all of that work, I figured that surely I could unravel some stitches and not be any worse for the wear. I found my courage and started ripping. Opal, a prolific knitter herself, quickly came to my aid. 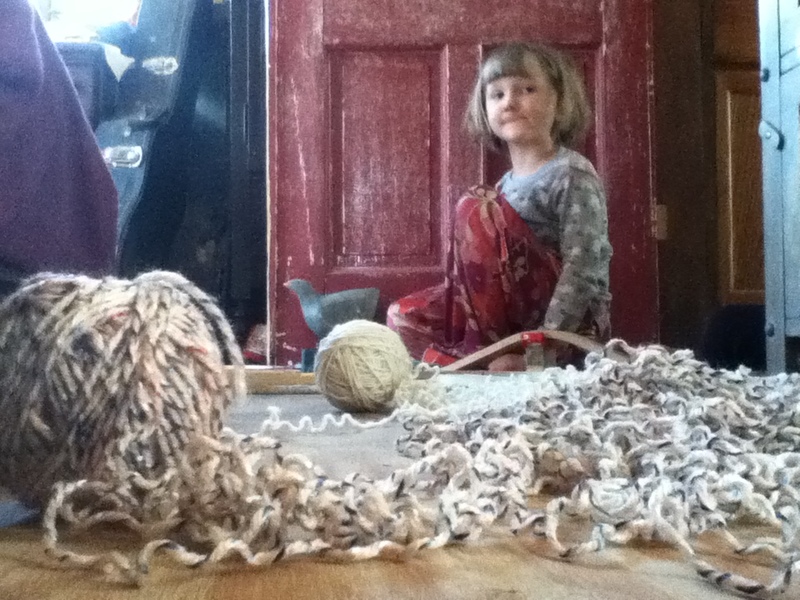 The piles of accumulating yarn were irresistible to her so she took over the “frogging” (knitter’s lingo for unraveling) while I did my best to ball up the lengths of yarn before they became a tangled mess. In no time at all, in fact a lot less time than it took to make all of those stitches in the first place, there was not even a hint of the previous project… just several balls of yarn eager to be transformed into something else. And do you know what? 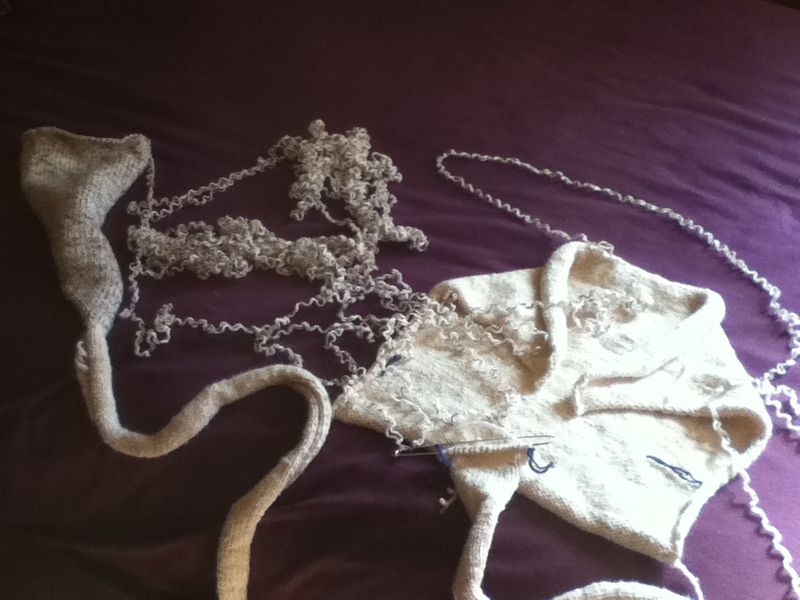 Once I got going, it actually felt good to unravel that sweater. 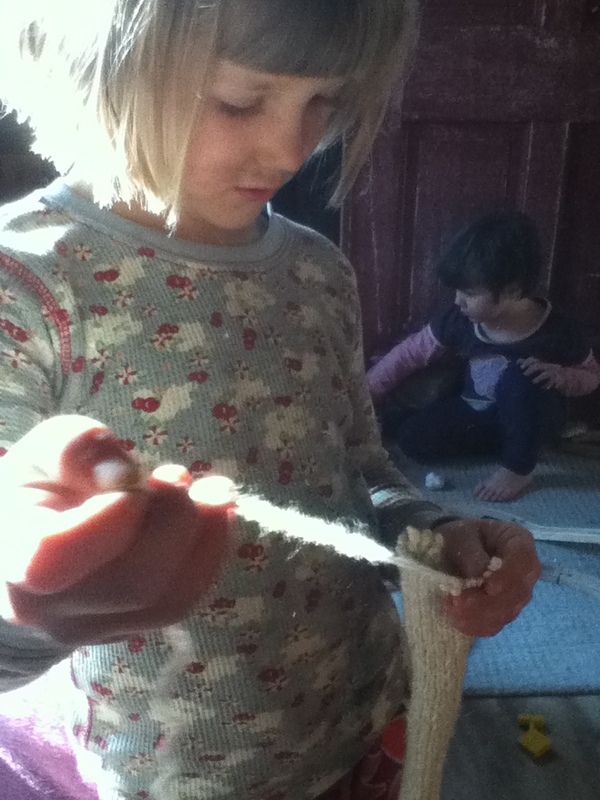 It was just as fun as the knitting itself. 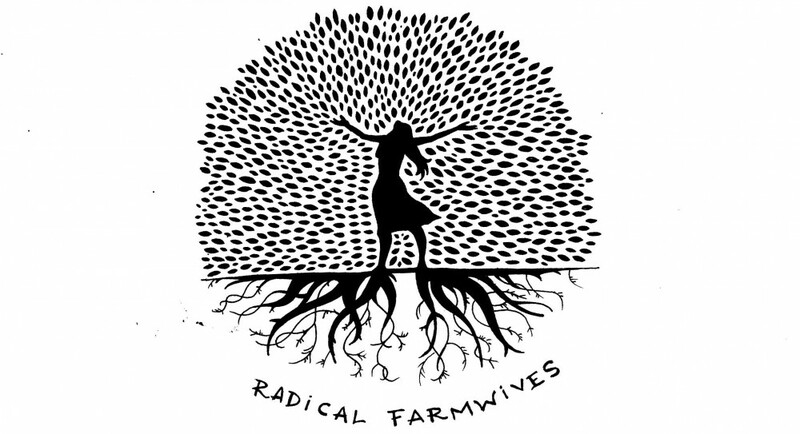 To some it might seem like a giant step backwards. The reality, though, was that the entire process was a learning opportunity… I was also reminded of the liberating freedom in letting go. 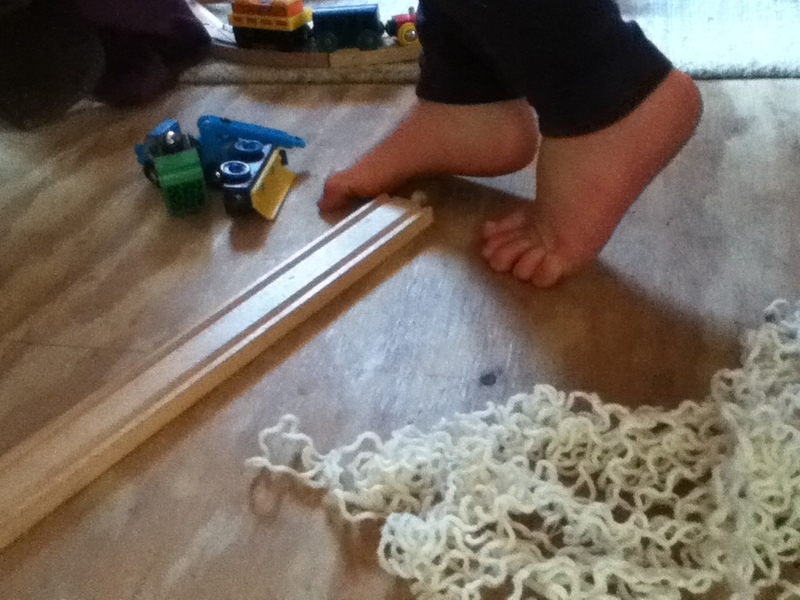 This entry was posted in cher's posts and tagged children, family, frogging, hand-knits, knitting, learning, life learning, playing, wooden toys by cher. Bookmark the permalink. I have been attempting to start 3 different projects over the past two weeks and they just aren’t working. One of the problems is that I am not following a pattern, so just kind of judging how many stitches I need, then knitting a couple rows to see if it looks big enough – twice it wasn’t, once it was too big. Then my DPNs just were not working – I was doing something wrong but couldn’t figure out what. 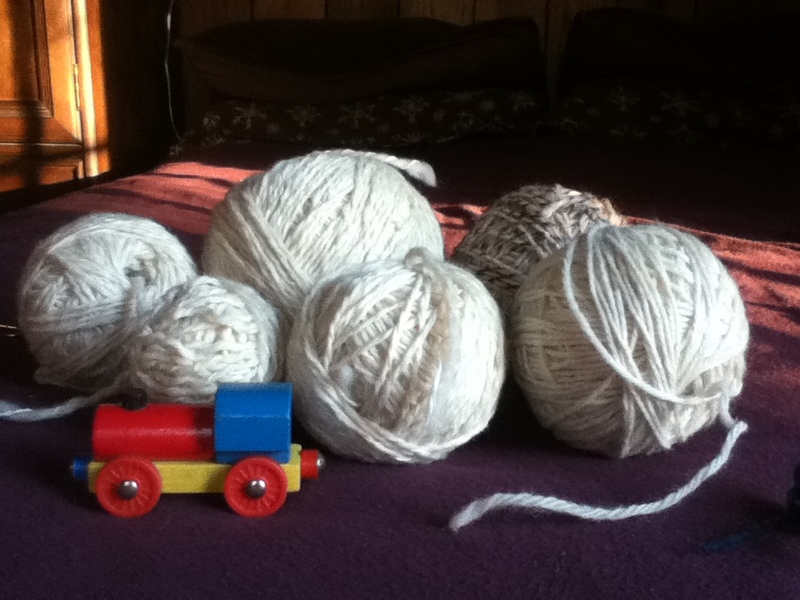 So I scrapped all of those projects for now and broke out the big chunky yarn and big straight needles – back to basics. And after you unravel the first time, it doesn’t seem like such a big deal after all. Lots of practice sessions and passing the time in the car, so it wasn’t all for nothing.